No. 38 Rouge Flamboyant is that classic Red that never goes out of fashion. With a rich berry shade, gorgeous creamy texture and super shiny finish this is so strikingly pretty, that my manicure above was mistaken for a gel mani. Out of habit, I always apply two coats and a top coat however, if you are in a hurry, you could quite comfortably get away with applying one coat. Obviously, for longevity, to make the most of your manicures and to stop premature chipping - the more coats the merry. 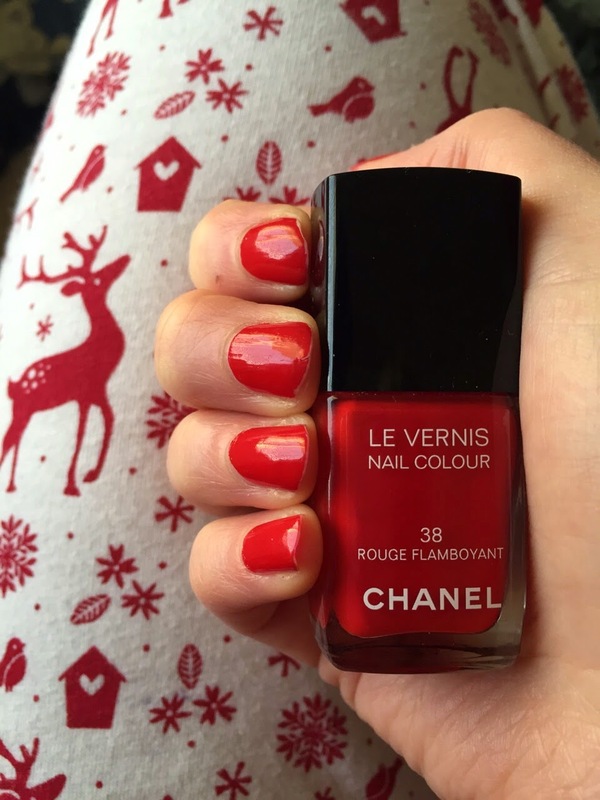 The Le Vernis formula by Chanel is second to none and an absolute favourite of mine, yes they do cost a bit more than your high street brand and some may argue that you are paying for the name but in this instance, I do believe you are paying for a top quality product. This colour is gorgeous on you and so festive! Love it! I love that deep red colour.